Lower knee injuries are often the result of overuse from repeated movements, constant jumping, landing or changing directions. This can cause strains, tears and damage. It is common in athletes who regularly play sports that involve a lot of repetitive jumping like track and field, basketball, volleyball, gymnastics, running, and soccer. Place knee at a 90 degree angle so the skin of the knee is slightly stretched. Fold tape in half and cut around the corners, on the folded end, to round the corners while dividing the tape into two pieces. Twist and tear the backing paper down the middle and fold it away from the adhesive leaving the ends of the tape covered so they can be used as handles. 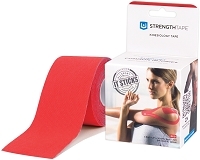 At a 75% stretch, apply the tape at a 45 degree angle, over the point of pain. Finish removing the rest of the backing tape, and anchor the ends with zero stretch. Twist and tear the backing paper down the middle of the other half of the cut tape in the same manner as the first half. 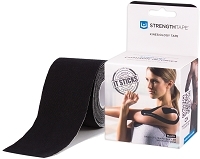 Stretch the tape to 75%, and apply over the point of pain in the opposite direction from the first to form an "X", and anchor the ends with no stretch.